FEDERAL ASSISTANCE: Registering online at www.DisasterAssistance.gov, is the quickest way to register for FEMA assistance since the event will last several days and the full scope of damages may not be evident until the storm has passed. 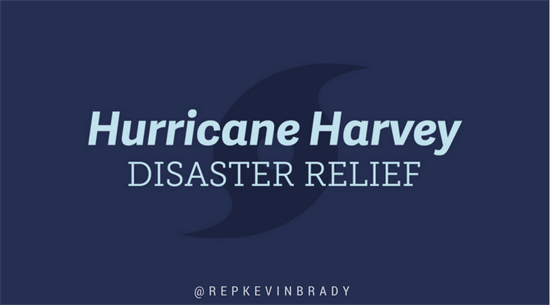 If you are unable to access the internet, you can also call at 1-800-621-FEMA (3362). CLICK HERE for the Disaster Recovery Center locator website. CLICK HERE for Texas' Hurricane Recovery website. CLICK HERE for more up-to-date important information regarding Medicare & Medicaid services. Hurricane Season runs from June 1st until November 30th. Being prepared is important for every family and business. That means having a hurricane safety plan, because it is never if a hurricane will hit Texas, but when. The hurricane experts at the National Oceanic and Atmospheric Administration are predicting an above normal Atlantic hurricane season, with the formation of 11-17 named storms, including nine to nine hurricanes that could threaten the U.S. coastline or the Caribbean. Two to four hurricanes are expected to be "major" with sustained winds of at least 111 mph. Expected warmer-than-average waters across the tropical Atlantic Ocean and Caribbean Sea, weaker-than-average wind shear and a weak or nonexistent El Nino are expected to feed this hurricane season. In an average Atlantic hurricane season, there are 12 named storms, six of which become hurricanes and two major hurricanes of category 3 or higher. Storms are named when they are designated a tropical storm, with minimum sustained winds of 39 mph. When windspeeds reach 74 mph, the storm gains hurricane status. Inventory your property. The camera on your cell phone should get you what you need. Remember flood insurance will not go into effect until 30 days after your purchase. Have all your important documents in a safe, easily moved container to take with you if you must evacuate. Keep all trees and shrubbery trimmed. Winds in excess of 55 mph can blow large branches right off the tree and into your home. Acquire a NOAA Weather Radio. One of the most important tools of the hurricane season, the NOAA radio broadcasts up-to-date weather reports, evacuation routes, and other pertinent information. ALWAYS know you county’s evacuation plans and routes. Know what roads to use ahead of time so you will not be stuck in traffic during an evacuation. Additional tips and helpful resources, such as claims hotlines, can be found on AIA’s Catastrophe Central web page HERE. Contact their insurer(s) immediately after the storm to report all losses and damages. Having your insurance information will speed things, so locate that as soon as possible. Keep all recovery-related receipts including for meals and lodging as those might be covered under the “additional living expenses” portion of your insurance policy. Businesses may also have coverage related to interruptions caused by the storm and should maintain records, receipts, etc. Prepare a list of all damaged property (structure and contents), and if possible, photograph or video the damaged items. Return claim forms as soon as possible to your insurer. Work closely and stay in regular touch with your insurer. When you rebuild, ask your contractor about adding features that would increase the building’s disaster-resistance. Ask questions if you are unclear about your policy. Hurricanes have a number of jeopardizing effects when they make landfall, the most common being wind speed and flooding. Even a category one can have winds of 74-95 mph. More severe hurricanes can be slow moving, causing flash flooding in low-lying areas. Hurricanes can also produce tornadoes. The more intense the hurricane is, the more likely that it will produce multiple tornadoes. The most terrifying effect of a hurricane is the storm surge. A surging large dome of water, often 50-100 miles wide, can sweep along the coastline when a hurricane makes landfall. Coastline areas are most vulnerable to storm surges and should take the highest precautions. What is the difference between a tropical depression, a tropical storm, and a hurricane? counterclockwise circulation and maximum sustained wind speeds of 38mph or less. and maximum sustained wind speeds of 39-73mph. At this stage, the storm is now given a name. wind speeds of 74mph or higher. The storm surge of the hurricane produces more casualties than the wind or rain.